Around 1880, the village council talked about purchasing a hand fire engine. At the time, all they had was a hose cart and it wasn't in very good condition. On April 11, 1882, an election was held to elect two fire wardens. John Sullivan was elected as the North District Warden and L. M. Rutherford was elected as the South District Warden. During the early winter months, the Fire Wardens would inspect the stoves and stove pipes for defects. They were paid 50 cents for each hour they worked. It wasn't until October of 1882 that the council held a special meeting to take into consideration the purchase of a fire engine. Thirty-seven citizens signed a petition in favor of purchasing the hand fire engine with all the necessary equipment. On July 30, 1883, the village of Almont agreed to purchase the fire engine from C. G. Carleton and Company. The village council could not agree on what to name the engine. Mr. Simon proposed the name "Almont" and Mr. Moore suggested "Cascade". After much discussion, they settled on "Almont Hook and Ladder". 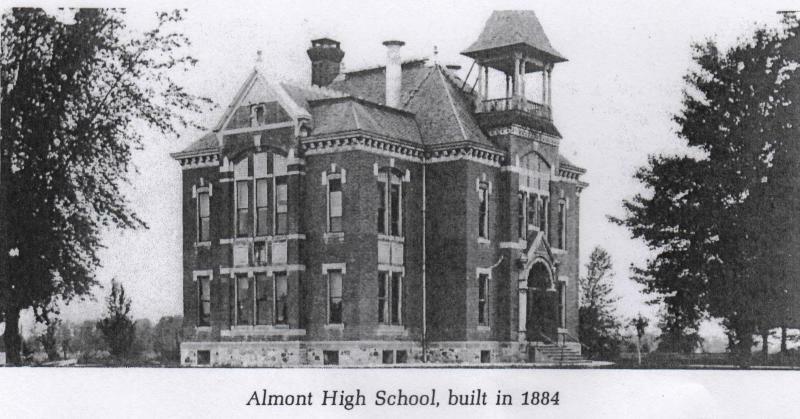 On April 16, 1883, a special election was held for the purpose of funding the erection of a building i n Almont which would contain a council room, fire engine room, jail, and town hall. In the meantime, the fire company rented a barn from Mrs. Saviguy for $2 per month to store the fire equipment. 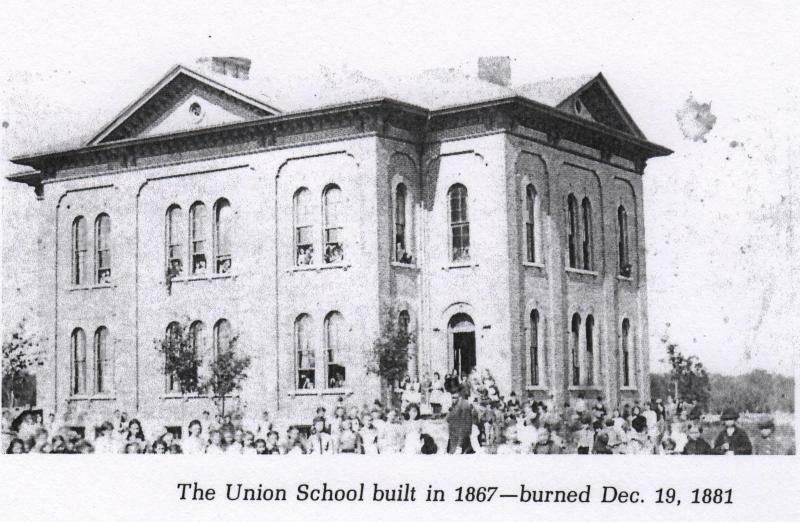 On March 6, 1884, the building was finished. The building still needed to be furnished and a stove was bought on April 8, as well as 300 chairs, a few lamps, and a desk for the council room. It wasn't until September 28, 1886 that a fire bell was purchased from Runsey Company of New York. John Jarvis was hired in May 1888 to take care of the Town Hall. He received 50 cents a night to take care of the Town Hall, 25 cents a night for the council room, and 12.5 cents an hour to keep the fire engine room in order. Although the main part of the building is gone today, the engine room in the back of the building is still there and was still used until the new fire hall was built in 2007. On April 28, 1885, L.O. Folsom was appointed the first Chief Engineer of the Almont Hook and Ladder Fire Department. It wasn't until 1895 that the village of Almont voted to pay their brave firemen. Each fireman would now receive 25 cents once a month for answering roll call at practice. 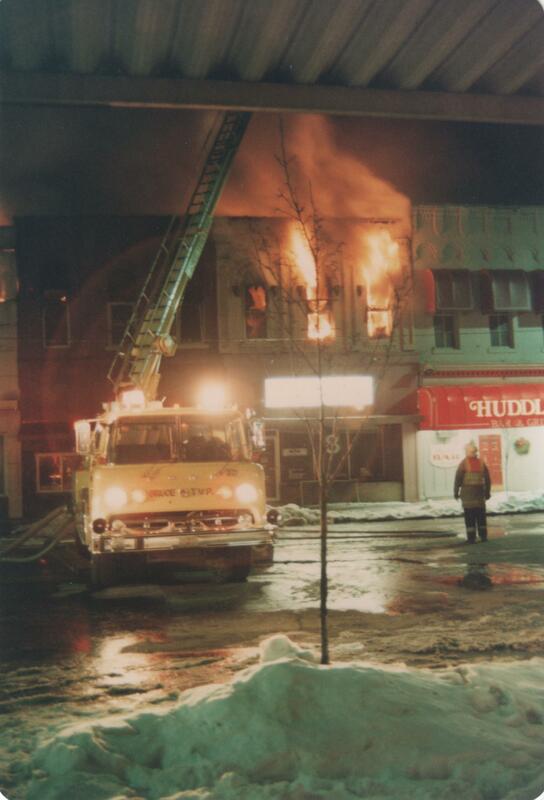 The Hook and Ladder company was allowed to hire up to 25 firemen. Historical materials provided by Henry Stephens Memorial Library. 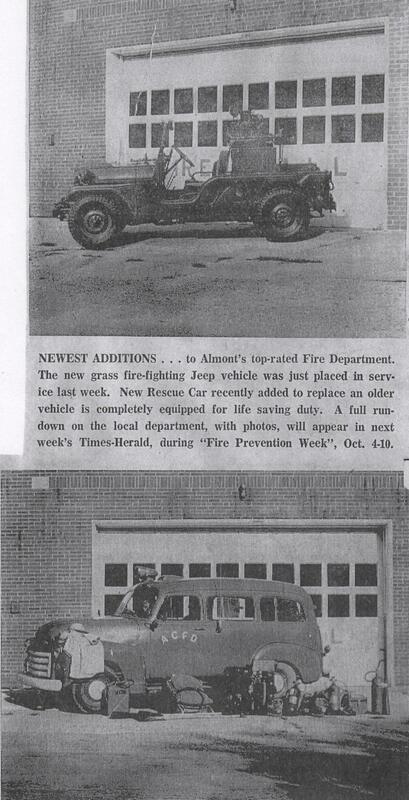 Almont's first truck with an automotive pump was purchased by the community in 1927. It was a 1928 model REO Spe edwagon with a 500 GPM Boyer pump. 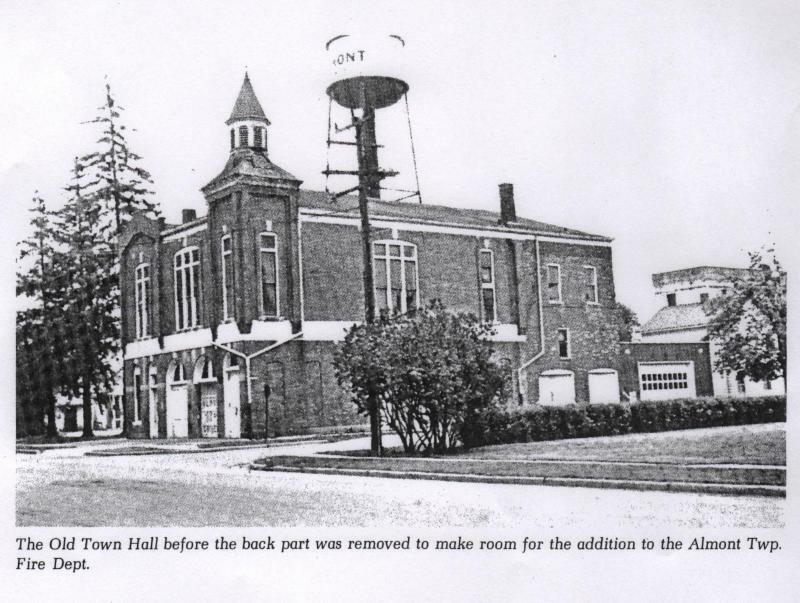 The Almont Fire Department was housed in the Town Hall until a cement block building was built around 1950 by Ernie Force, a builder from Attica. 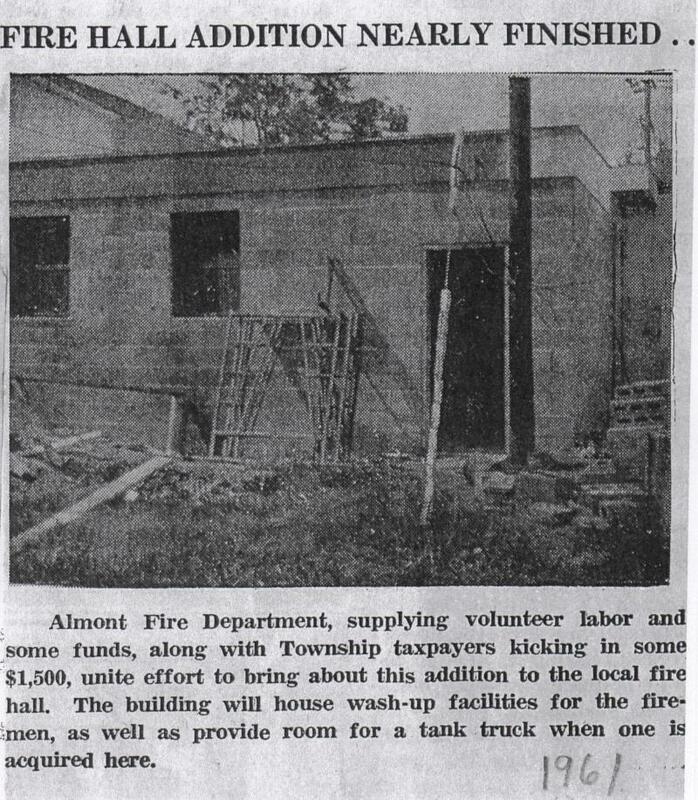 In 1961, an addition was added to the back of the fire hall to add bathrooms and room for a tank truck. The materials were purchased by the township and the firemen volunteered their labor. By this time, it was no longer a Fire Department just for the village of Almont. This way, the village and township residents would be included in paying for fire protection. A few Ford truck by Darley was purchased in 1975. It is a 750 GPM tank for water and cost $27,000. In 1976, another addition was added. Two large truck bays and a meeting room were built, giving the department the much needed room. In 1981, a used 1978 Ford 750 was purchased that replaced the REO Speedwagon for a tank truck. A surplus tank truck was purchased from the government in 1985 and a 2400 gallon unit was put into use. This replaced the 1953 Darley. The Almont Ash Sifters Auxiliary was formed in 1971. Charter members were: Lil Hamilton, Monica Wilcox, Brenda Rosseau, Jadine Wright, Doris Clause, Mrs. Bill Abraham, Sharon Quinn, Rose Bishop, and Lucy Stine. At that time, the purpose of the organization was to aid the fire department by purchasing needed items that were not furnished by the township. Blankets and other items were then purchased for the department by the Ash Sifters Auxiliary. The purpose of the auxiliary was to serve the community and the Fire Department. They did this by serving food and coffee during fires or whenever there was a need. They also helped the fire department on various activities, whenever they were asked. The auxiliary assited families in the community when they were burned out of their home, or in any other disaster that might have happened in Almont Township. At that time, there were 30 firemen on the department. To join the auxiliary, you had to be the wife or fiancee of a fireman. In the 1980's, the auxiliary purchased a Scott air pack and two hand held radios for the fire department. This was made possible by the taco sale they did during Almont's Summerfest. They also held other various fundraisers to raise money for equipment or supplies the fire department needed. About half past 7:00, light was observed in the basement windows and the alarm given. Directly a crowd was on the grounds, many carrying pails which were filled from the well in front of the schoolhouse.Two or three chemical fire-extinguishers were also there. But the smoke was so dense that no one could get very far inside the bu ilding and the fire could not be located. There is a small hand fire engine belonging to the village but it did not appear that it was the business of anyone in particular to bring it to the fire, and some thought it would not work anyway. After about an hour, some boys went after it and brought it along just for fun. Some proposed pushing it into the fire so that the town might get a better engine. The little thing however was placed in position and found to be in good working order, and threw an astonishing quantity of water; indeed it was evident that had the machine been brought along with the crowd at first, the fire could easily have been put out. But it was too late now. The building had just been reshingled and 60,000 old shingles were piled up in the cellar close to the chimney. The fire might have started from the furnaces, or the burning soot might easily have come down the chimney through open soot holes at the foot and set fire on the shingles. The building was formerly insured for $10,000 but our economical school board thought they could save $24 a year by cutting the insurance to $6,000. The total loss was $17,000. The building was an elegant and substantial two-story brick, erected in 1867 from plans by G. W. Lloyd of Detroit.The dimensions were 60 by 80 feet on the ground, height from grade to cornice 43 ft., height of chimneys 64 ft., extreme height to top of bell tower 90 ft. Over 375,000 bricks were used in its construction; and the building was well finished throughout. On August 16, 1883 Mr. Gibbs of Mt. Clemens, or Town Hall architect, submitted a second plan for the schoolhouse and it has been accepted. The first plan was too expensive. The new schoolhouse was completed and first occupied Monday April 14, 1884. 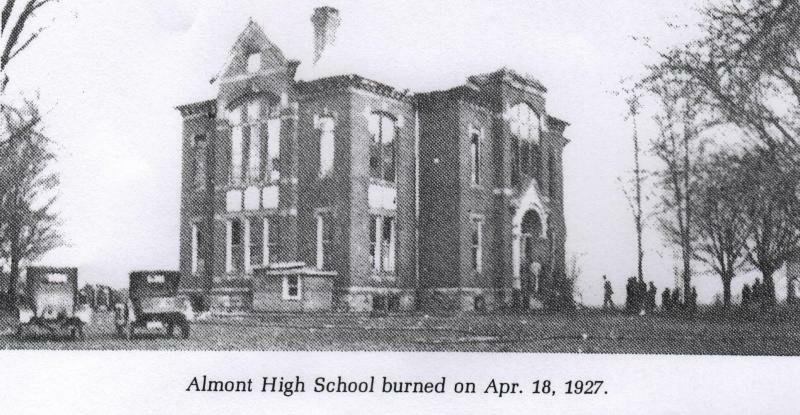 Fire was discovered in the high school building at Almont Monday night April 18, 1927. It was discovered about 9:00 by G. W. Anderson, who along with many other Almont citizens had smelled smoke for some time, but had been unable to locate its source. When it was finally discovered, the fire was burning in three or four places in the high school building, indicating that the fire had been set. Only a few books were saved, the majority of them having been damaged or entirely destroyed. Help was summoned from Richmond, Romeo and Capac, but about all that could be done was to save the walls of the building. The firemen, responding under the leadership of Fire Chief Charles E. Lewis, entered the basement, which was in flames, and noticed and spoke about a strong odor of kerosene. The fire in the basement was soon quenched, but meanwhile the flames had started up the heat and ventilating chutes and ignited the upstairs roof. Tuesday morning search was made for a large can of kerosene which the janitor, Alfred Walker, had purchased Monday forenoon and left, full, in the basement. Mr. Walker, arrived during the fire, remembered the kerosene and threw the can out of the basement. Whether any of the oil had been used by incendiaries, he doesn't know. All indications point to the fact that the fire was of incendiary origin. There had very recently been considerable trouble at the school last week and it was a scene of a student strike in which nearly all of the 85 students of the High School walked out in protest against the dismissal of E. R. Bristol, former superintendent, and the subsequent promotion of Duane Black, a teacher, to the position of acting Superintendent. Bristol's dismissal followed his refusal to bar from the school, a girl who had been discharged from the Girl's Training School at Adrian. Members of the Almont Baptist Church objected to her presence in the school alleging a bad influence on other pupils and the board of education, of which three of the five members were members of the Baptist Church, voted to dismiss the Superintendent. Mr. Black was temporary head of the school system and the pupils walked out. Several of the members of the newly-formed Almont High School Band led the parade downtown playing a well-known song at that time, "Bye, Bye, Blackbird". School reopened Monday morning with A. T. Hagerman, formerly of Highland Park, as Superintendent, and with three new teachers. Apparently all differences had been settled. Peace had, it appeared, come to Almont High School after a week of strife and faction differences. That night the building was reduced to smoke and ruin. "Almont - A Sunday fire in three-turn of the century buildings in the Lapeer County village will take its toll on the town, the village manager said. 'It will have an impact on the character,' said manager Gerald Oakes, explaining that whatever replaces the burned structures may look out of place among the old buildings. Two businesses were demolished and two extensively damaged in the Sunday night fire. Also destroyed were three apartments above two of the businesses, leaving seven people homeless. No one was injured. 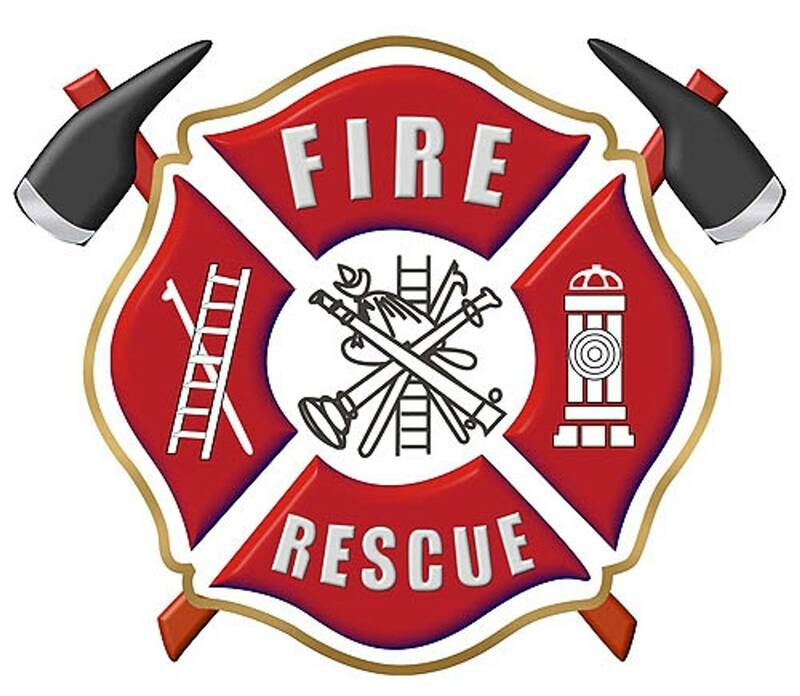 State Fire Marshal James Fayhe said the fire is believed to have started in the chimney of a wall-mounted space heater in the back apartment over The MidTown Restaurant. He estimated the damage from the blaze to be more than $500,000. Seven fire departments were called to assist Almont with the fire, which was less than a block away from the hall. Although the fire was the largest to hit the village in many years, it is not the first time a blaze has changed the face of the community. An old hotel once stood on the site many years ago, Oakes said. 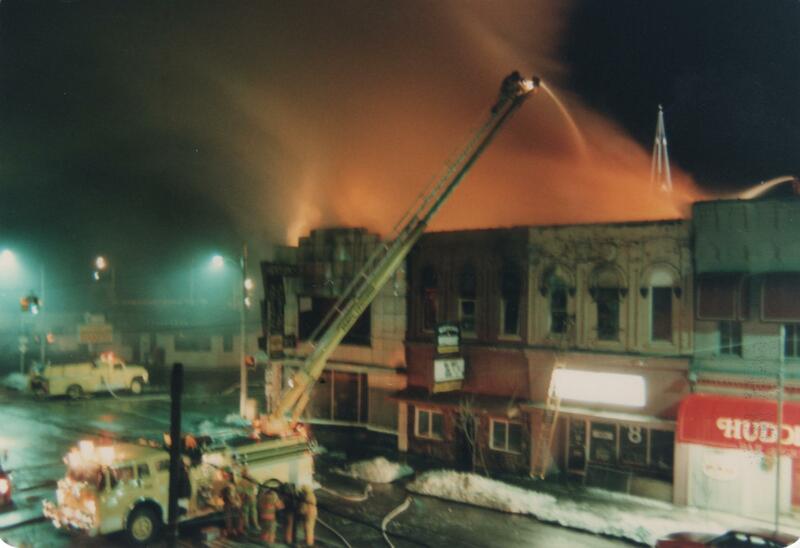 The wooden structure burned and was replaced by the building w hich until Sunday housed Mollon's Antiques. 'This town has been burned and rebuilt (in several places),' Oakes said. 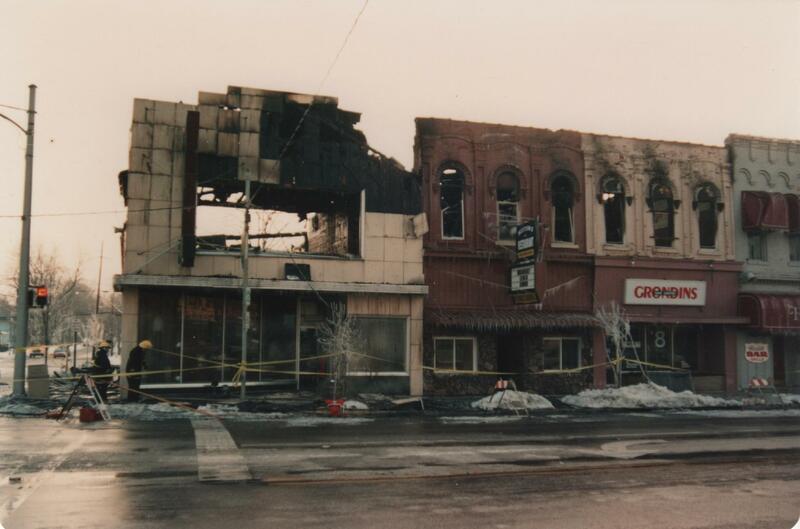 The MidTown Restaurant, which was gutted in the fire along with Mollon's, had recently been refurbished and was under new ownership, Oakes said. 'They were just starting to get on their feet,' he said. Grondin's hair salon, which was extensively damaged, has been in Almont for six years, said the owner K.C. Grondin. He and his wife lived in an apartment above the store, which was destroyed by the fire."